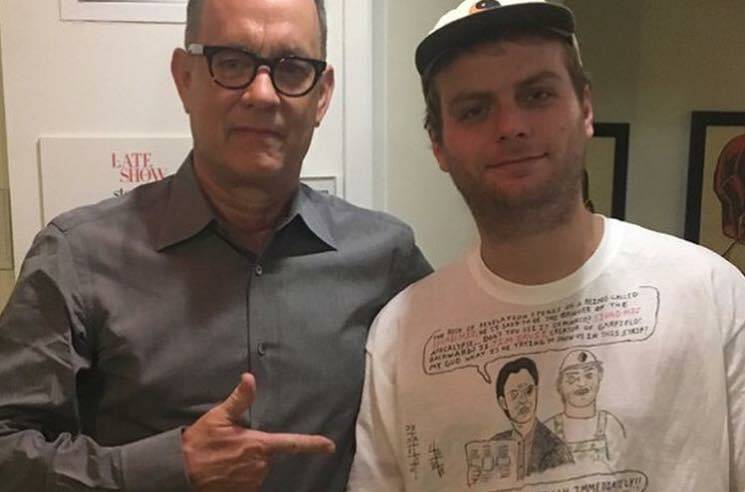 Last night (December 12), Mac DeMarco and Tom Hanks both appeared as guests on The Late Show with Stephen Colbert. Naturally, the pair got a chance to meet backstage, and DeMarco made it super weird by wearing a shirt with both of their faces on it. The comic strip-style tee features Hanks and DeMarco as the stars of a Da Vinci Code and Garfield mashup universe dubbed DeMarco Code. The Hollywood actor seemed pretty chill about the whole thing, posing for a photo with DeMarco — managing to maintain a facial expression of polite bemusement. Check out the Instagram proof of the encounter below. You can also check out both guests' appearances on the show down below. DeMarco joined Colbert's house band Jon Batiste & Stay Human to play "One Another" off this year's This Old Dog, while Hanks was there to promote The Post. Pick up This Old Dog on silver vinyl via Umusic.